Oh Lord, I hope my mother doesn't read this post! She would die if she saw how much stuff I got this week! Honestly, I'm not even 100% sure if this is all of it, I may have missed a couple of polishes I got at the store! Don't worry, I don't plan on making this a regular habit so there's no need to call an interventionist! 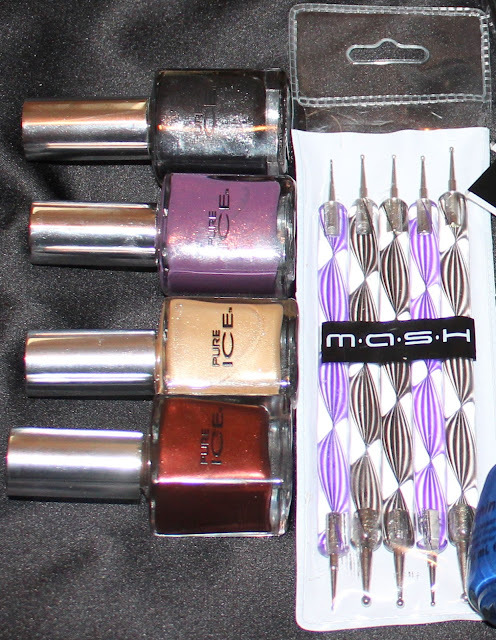 Without further ado, here is a shot of all of my nail swag - details to follow after! Okay kids - on the top row here is butter LONDON Black Knight. Then comes Julep in Gayle, Olivia and Donna. Next is Lancome in Rose Boudoir and Midnight Rose. Finally my first Pomegranate polishes in Fiery and Princess of Persia! 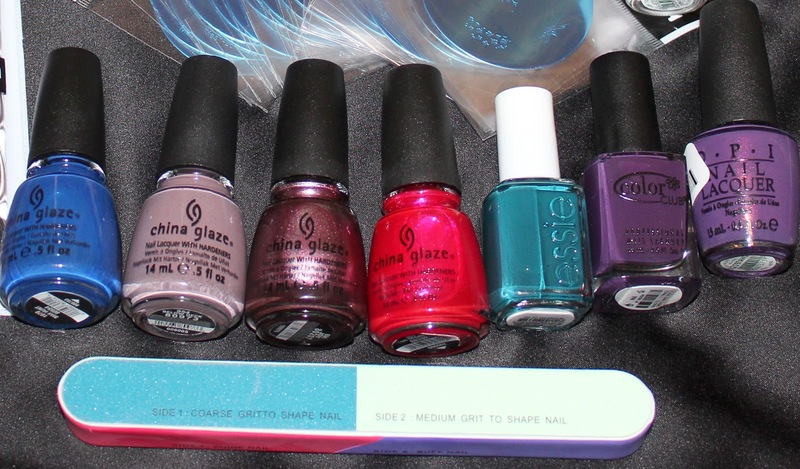 In this fine row is China Glaze in Man Hunt, Below Deck, Joy and 108 Degrees. Then it's my little Essie in Overboard and Color Club in By Design and finally OPI Dutch'ya Just Love OPI? Then a sweet little 7-surfaced file that I love! I also got some Pure Ice at the store, colors are Magic, Jaguar, Purple Reign and Electric! Then I also got my first set of dotting tools from Mash - yayyyy! Here are my new 2012 Mash plates - soooo psyched about these and my OPI Alpine Snow! Whew! That is a lot of stuff! My wallet is in some serious pain but my fingers are seriously happy! Also, in order to validate my purchases and make myself feel a little better I would like to know, what is the most you've spent in a month on polish and accessories? Come on - 'fess up!! The stencil worked great but there's only one of each image and I don't think you could use it 10 times, I used mine twice and the polish was getting built up. You might be able to make it work if you were very careful but the acetone I tried to clean it with ruined the stencil! Anywho - on to my mani! For this one I used 3 coats of Wet n Wild Tickled Pink - I really like this color, it's so soft and pretty! Then for the accents I used Essie Merino Cool. It's a gorgeous grey/brown color and the only Essie I own until my shipments gets here! So, without further ado, here are the pics - sorry if there are a ton, mama is proud of her baby! Are those pictures obnoxiously large? I'm never quite sure! Let me know what you think, good or bad I luvs me sum comments! Stay tuned because I have a huge haul coming in from Amazon, Sephora and TransDesigns. There are 14 bottles of polish, dotting tools and the 2012 Mash plates on their way, YAY! 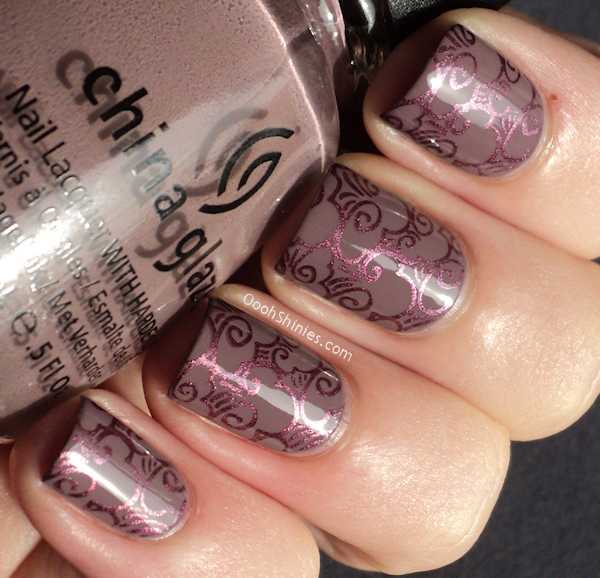 Today I'm bringing you another mani to laugh at! This is actually my best so far so I'm actually kind of proud of it - HA! Since some of the dots ran together I'm almost tempted to call it a "blob mani!" I think Blob is the slovenly cousin of Dot over at YoungWildAndPolished. If you check the link you will see what a pretty dot mani looks like! I had actually tried about 3 other manis before this. I'm not sure if I'm actually happy with it or if I was just tired of trying! So here you go...your joke of the day! Let me just make an excuse for myself - I realized after I was done doing this that the end of the paintbrush I was using as a dotting tool had a little sliver of plastic sticking out so it wasn't completely round. There, that explains it, right? All three polishes were Wet n Wild Megalast and they were I Need A Refresh-Mint, On A Trip and Through The Grapevine. I absolutely love these three colors, especially together. I want to do a splatter mani with them, or maybe a water marble, but I'm not there skill-wise yet!